"This novel of siblings rocked by their father's Huntington's disease is a total tearjerker, but ultimately it's a tribute to family love." "An intimate, heartbreaking look at life with Huntington's disease." "Genova...compassionately details how an illness—this time Huntington's disease—can destroy not only the afflicted, but those who love them as well." "A gut-wrenching and memorable read." "Inside the O'Briens is...about resilience and hope." "Sympathetic, absorbing, multifaceted characters compel the reader's compassion. While Genova's background in neuroscience allows her to portray medical issues accurately, the heart of the O'Briens' story is human....Poignant and painful, warm and redemptive, Inside the O'Briens displays Genova's established strengths in bringing neuroscience to the lay reader, and portraying the power of love." "Inside the O'Briens . . . promises to do for Huntington's disease, what Still Alice did for Alzheimer's." 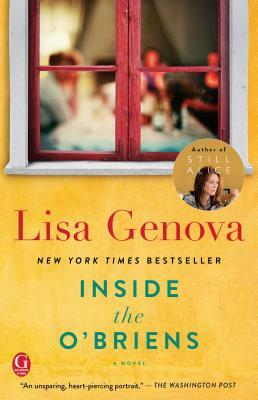 "Lisa Genova’s deep empathy for her characters shines through this poignant and uplifting story about family, grief and the resilience of the human spirit. Kudos to this amazing writer for showing us—once again—the transformative powers of even the most devastating events. Do not miss this fabulous novel." "For the characters in a Lisa Genova novel, there is no way out, for genetic destiny has sealed their fate. And yet, for us as readers, there also is no way out, for we have no desire to look away. In his fear and courage, Joe O’Brien is an American hero. Huntington’s disease will claim his life, but not his capacity to love. This is Genova’s genius. A bold, skillful writer at the height of her narrative powers, she makes us long to hope for the hopeless and comfort the condemned. In their hard journeys, we find the small shining promise of every single ordinary day." "Lisa Genova’s subtle, finely tuned prose gains momentum until you don’t know whether to laugh, cry, or give thanks. Like all of her work, Inside the O’Briens is brimming with candor, pathos, and deeply human characters. I didn't want the book to end!"